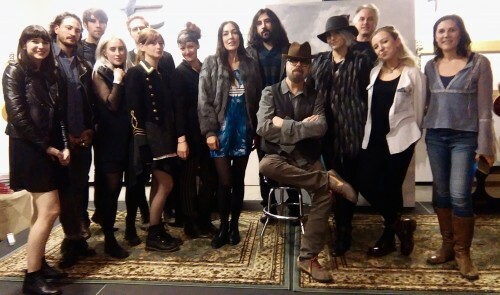 The FAC hosted its very first Open Artist Session in the USA with none other than Dave Stewart, perhaps best known as half of pop-synth legends Eurythmics, but also as a songwriter and music producer with over 50 years of experience in the industry and, above all, a true innovator and a tireless champion of artist entrepreneurship. A small group of artists were fortunate enough to hear him share his amazing stories and get a wealth of advice at Gibson's showrooms in Los Angeles. Dave talked about the importance of “clearly defining your world”, to be “unique and not compete” in order to get ahead in today's ever changing music industry. One of the key take-aways was the importance of brand partnerships and how much scope there is to be innovative within that space. He also touched upon the creative process itself and gave tips on how to free yourself up to be able to capture ideas when they come along (“to harness that space in between thoughts”). Artists at our first USA Open Artist Session were also treated to a demo version of Dave Stewarts First Artist Bank (FAB), which is in development now and aims to further empower artists. Some of us even won a copy of his amazing new book... Dave, thank you so much for taking the time and for sharing your invaluable experience – we all left inspired!